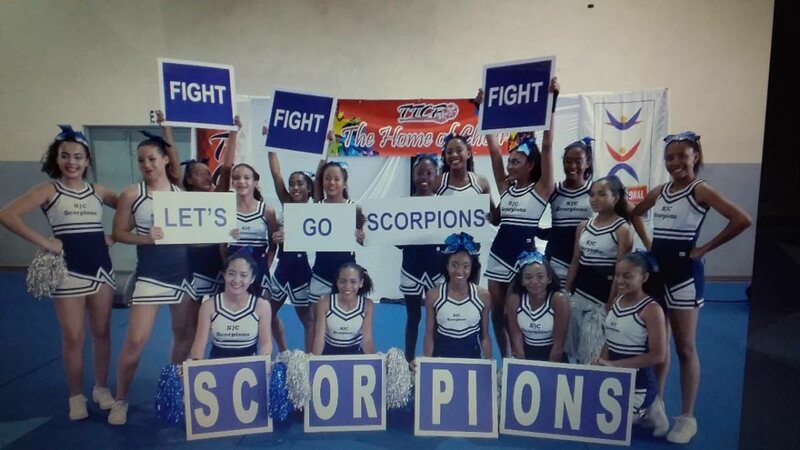 St Joseph's Convent Port of Spain Scorpions will be competing in the World School Cheerleading Championships in Orlando, Florida next month. THIRTY-TWO Level II student-athletes from St Augustine Girls High School (SAGHS) and St Joseph's Convent (SJC) Port of Spain are on their final stretch of preparation for next month's World School Cheerleading Championships. The event, sanctioned by the International Cheer Union (ICU), will run from February 8-10 at the ESPN Wide World of Sports Complex in Walt Disney World Resort, Orlando, Florida. The teams are expected to leave for competition on February 6. SAGHS' cheer team will be making their debut, while SJC will make their second appearance at the competition, having last competed at Level III in 2017, when they placed fourth. "We are hoping to improve on that although it's a different level," said St Joseph's Convent teacher Yasmin Khan-Lee Wen, in an interview with Newsday during a training session at the school compound last week. The SJC Scorpions will challenge in the non-tumbling division at Level II, as the majority of their Level III students graduated. The two teams qualified for the event owing to their performances at the National Cheer and Dance Championships, hosted by the TT Cheer Federation (TTCF), last July. At the National Cycling Velodrome, Couva, SAGHS and SJC produced the best routines as evidenced by the two teams' sweep in the various divisions. SAGHS dethroned long-time winners SJC for the Intermediate (Level II) title in the Team Cheer Division as well as the Level II title in the Group Stunts Division. SJC, however, captured the Level II Hip Hop Senior Division title, along with the Youth Open Division (Level I) and runners-up in the Intermediate Division (Level II). The two teams have been hard at work preparing for the upcoming competition. According to Khan-Lee Wen, also one of the team's managers (along with Valerie Shepherd), the girls train twice weekly and increase the momentum with additional training provided by the TTCF when a major event approaches – such as the World School Cheerleading Championships. The TTCF hosted two week-long international training camps last August and December and will stage another this month, under the guidance of a foreign-certified international instructor. Looking ahead to the event, Khan-Lee Wen said a top-three finish is the target, but silverware will be cause for massive celebration. She said, "And, of course, the bragging rights. It's also bragging rights for our country, TT. So we want to represent the country and bring a trophy back to show that cheerleading is not only a Canadian or American sport but that Trinidad as well can shine." This trip to compete abroad has been challenging not only for the cheerleaders, but parents as well. She said, "As you will know, for a lot of the schools in the country – not only ours – funding is very difficult. Government is going through a very difficult time right now and so we have really not been receiving funding. And the funding primarily is to maintain the school. "So what we have tried to do is...of course we have to pay coaches and the managers who will be leaving, who have to take care of the children; we have to do fund-raising for that as well as funding to cover the expenses of some of the athletes, primarily food." SJC hosted two fund-raisers for the event – the sale of restaurant vouchers for Svaada, of which part proceeds went to the team's travel fund, and a 5K walk/run. Khan-Lee Wen has encouraged those who want to contribute to offsetting their travel expenses to either make a cash donation or write a cheque payable to St Joseph's Convent Port of Spain. The 14-member SAGHS squad will be managed by Christel Mc Knight-Strachan and coached by Sharon Charles. SAGHS too had to raise funds for the trip by hosting a fashion show and various sales, but will welcome contributions from well-wishers. Kaitlin Camacho, Chena-Marie John, Gabriella Thong, Gabrielle Gaulteau, Caitlin Gaulteau, Michelle Lue Fatt, Roshelle Lue Fatt, Chelsea Mc Comie, Aaliyah Mohan, Ttiana Mohan, Cecilia Qui, T'chelle Cedeno, Tyla Raghunanan, Sade Flemming, Kerisse Titre, Zahra De Freitas, Zoe Butts and Caylah Pereira. Shea-Marie Aaron, Amelia Ahwai, Adrienne Baptiste, Nadia Bhola, Robyn Bhola, Kamilli Campbell, Raejeanne Carrington, Dillana Clopton, Aquelah Francis, Shemiah Grant, Azara Hosein, Kurnisha Plowden, Amaya Perreira and Jaydah Smith. Reply to "School cheerleaders take on the world"